I had a moment this morning that kinda took me by surprise. It is Wednesday morning after the 2016 Presidential Election. My boys and I were doing our morning devotional, and during it we stood to recite the Pledge of Allegiance. As my little boys stood up tall, putting their hand over their heart, my own heart filled with a deep gratitude for this wonderful country we live in. At that moment I realized the great obligation I have to teach my boys the importance of this great country! I suddenly understood the importance of teaching my boys that our Heavenly Father has a plan, and the Land of the Free is a part of that plan. The phrase “One Nation Under God” rang through my ears! As a mother it is hard to explain to my young boys the situation our country is in. There are many things they wouldn’t understand, but I also believe there are many things they could understand. To put it simply, if you teach your children what the media is portraying America to be, it can be a little disheartening. Through the media’s eyes, I have looked at what our country is becoming and as a mother it scares me. What will the future hold for our children? There are days when I get sucked into the fears that are portrayed in the media. Now on the other hand, if I look through the eyes of our living prophet, Thomas S. Monson, and through the eyes of all of the prophets who have lived, the fate of America becomes clear! My fear is wiped away, faith and hope takes its place. There will be a time that America will be great again! It will be a God-fearing country and this we know. What we do in our homes will permeate into our children’s lives forever. Lets fill their minds with great things and their hearts with love. Here are a few ways to do this…. 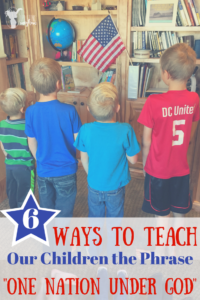 #3 – Teach your children the history of the flag and hang one in your home. Teach them how to handle and respect the flag. If you homeschool, recite the Pledge of Allegiance daily. 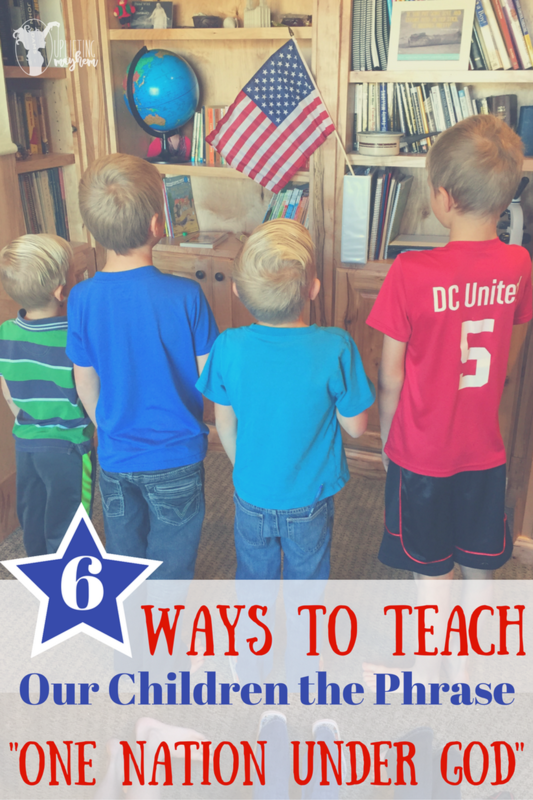 #4 – Teach your children to be grateful in all things, especially the opportunity to live in such an amazing country. #5 – Teach your children to have a sound understanding that God has a plan and we must trust in His plan. #6 – Sing and introduce Americas greatest songs such as the Star Spangled Banner, America the Beautiful, Yankee Doodle, God Bless America, You’re a Grand Old Flag, The Battle Hymn of the Republic, God Bless the USA. As I was saying my prayers last night, before we knew the outcome of the election, I asked my Heavenly Father to bless this country. My thoughts immediately went to the scripture story shortly before Christ appeared to his people in America. In Helamen 13:14 it states that the city was spared because of the prayers of the righteous. There are many people in America praying for this country! Pray as a family for our country and those leading it. Have faith and hope that one day America will be the country it started out to be and continue to be, one nation under God! Let it start in our homes and teach our children these truths.